We were told that there are 40 to 50 million uninsured in America. This misleading and wildly inflated statistic is based on the number of Americans who temporarily had no insurance. Even after Obamacare is fully implemented, 31 million people will remain uninsured. Some are voluntary, some are stupid, some are lazy slugs, some are mentally ill, some live on the margins, and yes, some are unfortunate victims. According to the WSJ, Florida Blue is terminating 300,000 policies, 80 percent of its individual policies in the state. Kaiser Permanente in California has sent Dear John letters to 160,000 people. High Mark of Pittsburgh is dropping 20 percent of its individual market customers, and Independence Blue Cross of Philadelphia is dropping 45 percent of their rolls. Since these insurance companies cannot meet the unreasonable mandates of Obamacare, they must shed hundreds of thousands of their customers to stay in business. There are so many taxes and levies built into Obamacare that by 2022 it will impose 1 trillion dollars in new taxes, almost all on the shoulders of the middle class. This is generational theft: a crime against our children, grandchildren, and generations to come. Average premiums for family coverage grew by $2, 976 by the end of Obama’s first term. One would have to be a moron to believe that Obamacare will lower costs. For most middle-class Americans, Obamacare will induce massive sticker shock and reverberate throughout the American economy. Yesterday, I was talking with a friend, a brilliant and talented cardiologist who is closing his private practice and establishing a health-care business with several other physicians. He said, “I don’t want to be a government employee. I’ve worked too hard all my life to end up like a DMV worker.” My friend’s patients will now have to shop around for a cardiologist who is willing to be an Obamacare schlep. You can bet your bottom dollar that thousands of skilled physicians will be fleeing the Obamacare nightmare. And of course, as people are kicked off insurance rolls and must shop for new insurance, their choice of physicians will be severely limited. As always with liberals/progressives/Democrats/socialists/greenies, the contrast between promise and reality is a yawning abyss. But for a significant portion of the political elite, good intentions — equality! fairness! utopia! — are far more important than facts. An “800” number that spells out F—-Yo, a zombie-like woman (I actually feel bad for her, getting sick for all the world to see… but not too much, as she allowed herself to be used to support this debacle) standing behind the Promoter Of The Unusable Site. Pure tragic comedy; the picture above is the perfect visual metaphor. Take away any of those promises (why did Obama’s nose grow a little each time he made them?) and even a Democrat House and Senate would not vote it into law. 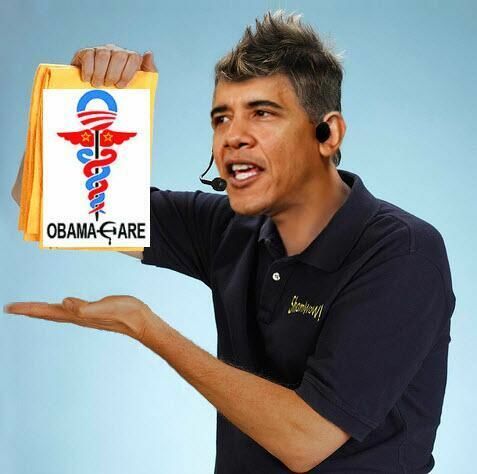 You also left out the biggest whopper – Obamacare would reduce the deficit!!! Holy Cow Batman! There are actual liberals that still believe that. Proof again that for liberals, math is really, really, really hard. You’re right, I left out the lie about reducing the deficit. So many lies, so little time to expose them. The shock at the bills is starting to come in – one caller from Reno mentioned a friend, diehard democrat – who got on the site and makes $25K/year – and her quote for the “bronze plan” is over $400/month – and this is with a $5,000 deductible. And all the people who have kept their policies so far are shocked at the increases – paying for people with pre-existing conditions who were in separate pools before. I have no sympathy for those who voted for him and are now going to suffer. I have lots of sympathy for the rest of us. And I don’t know why you imagine it’s going to get better. I think this is intended to break things but good. Remember that existing insurance policies must cover lots of mandated situations including those that wouldn’t apply to you without one or more biological impossibilities. As an artifact of such federal and state mandates, about two years ago my health insurance premium had a 35% increase. They knocked it down to that from a proposed 67% increase. When about one year ago they proposed to raise it another 39% I canned them. Good point. This “solution” is already common in many European countries with socialized health care.